Though originally designed to be self-paced and individually done, I had heard from a few ladies that the Journal and Doodle studies have been used with great success in a group setting. I asked them how it worked, and what they did and thought maybe it would encourage some of you too. "At the end of our winter session last year we began discussing our desire to do a study that required us to be less dependent on someone else’s teaching and more about taking a book of the Bible and digging in on our own and then coming together to discussing that each week. It was a scary prospect for me, because I did not feel qualified to come with one. However, I also knew that God had been prompting me to step out of my comfort zone and be less dependent on the DVDs and more dependent on Him. So I told them I would do some investigating and began searching. In the process I found your studies on Pinterest. I had been intrigued by things I had been hearing about Bible/Art journaling so that is what I began searching for. 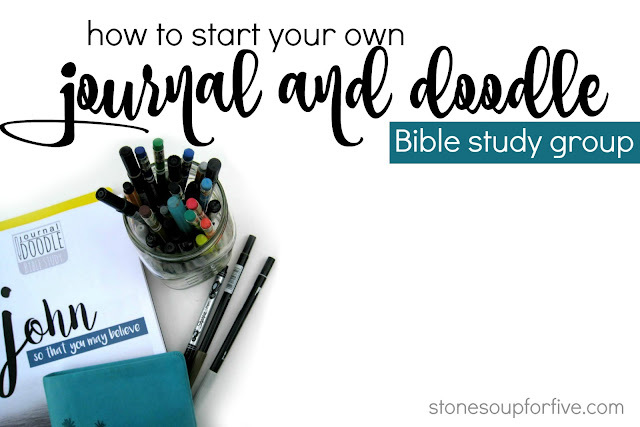 I was drawn to Journal & Doodle because they go beyond just artwork in your Bible and include actually studying a book of the Bible. 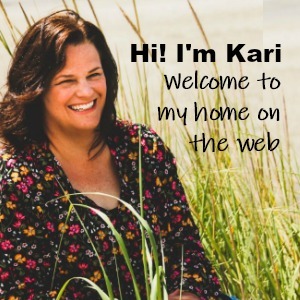 I shared your website with a few of the women in our group to get input and one of the women took an immediate interest and signed up for the Ephesians study and began working on it and was hooked. She and I shared about how we might use this in our group and she was my cheerleader when I was unsure this would work. She would call and say… 'I am so excited, I just have to share this with you…' and proceeded to tell me what she had learned in her lesson. 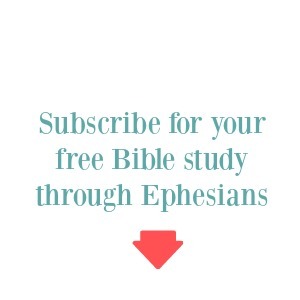 We decided to use Journal & Doodle through Ephesians (the free download in exchange for subscribing was appealing!). I created a “syllabus”, breaking the study up week by week, so we had a guideline to follow. The initial meeting was an introduction to what this type of study would look like. I gave them some samples of types of lettering, doodles, tips on journaling, and eased some fears of those who were unsure about the doodling aspect. I stressed to all the ladies that the primary goal was to get into God’s word and learn--the doodling was secondary. If they did not want to draw anything they could simply write in their journals. I also pointed out if they began spending too much time doodling and not enough time on the lesson they needed to pull back. A typical day in our Bible study began with prayer. We met from 9 a.m. - 10:30 a.m. The first 20-30 minutes we spent sharing prayer requests and praying for one another. The last hour was our discussion time. Everyone was expected to come with their lesson done and ready to discuss. I did not plan a formal lesson to teach, but shared from what I had learned. As the leader, I was prepared with a few questions to get the lesson started and facilitate the discussion to keep it moving. We had some great discussions and it was always interesting to hear how God, through the scripture, spoke to each of them. We have been challenged to study differently than many of us had done before, to share more than we might have before, and to try something new with the doodling (some who thought they wouldn’t doodle had even ventured into trying it a little). 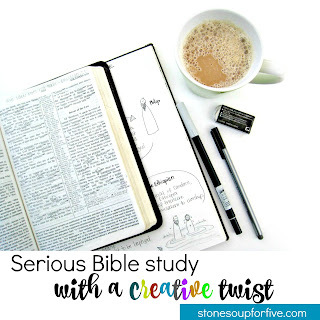 We have had a lot of fun with Journal & Doodle through Ephesians last fall that we decided to continue on and do Galatians and Philippians next." "We are all working women, so we decided to meet twice a month on Saturday morning at a local coffee shop. We do one chapter a week so we'll discuss two chapters together. We spend about a half hour catching up and then about an hour discussing the chapters. We go through each level loosely, talk about our summary statements, and then just enjoy hearing insights and sharing questions and life applications. At the end we pray for each other. I think all of us have really loved the freedom of the studies. Sometimes we have less time, so we just do level one and then discuss. Or other times we can give more to it and complete all the levels and just go deeper. We all love that these studies challenge us to look in the scripture and find the truth ourselves then find ways to apply it to our lives. The studies don't tell us what it means or what to do. We also are different in how we journal--some of us use more words and less doodles. I like to look over my journaling and add color to emphasize things that are meaningful. I really love looking back over my pages and seeing little doodles or boxes of color that stand out. We've done Ephesians, I Corinthians, Colossians, and are in Matthew, so I think you could say, we love your studies!" "We've been meeting in the home of one of our members. We're usually between 5 & 10 people and we talk over the Journal and Doodle study guide. We raise questions that we've come across in our study during the week. We usually meet for two hours, we share prayer requests and pray for one another and do the discussion." I love how each group does it differently in a way that works for them. If any of you are ready for a little more community and a lot more Bible than typical video-driven, fill-in-the-blank studies, I hope you'll start your own group! 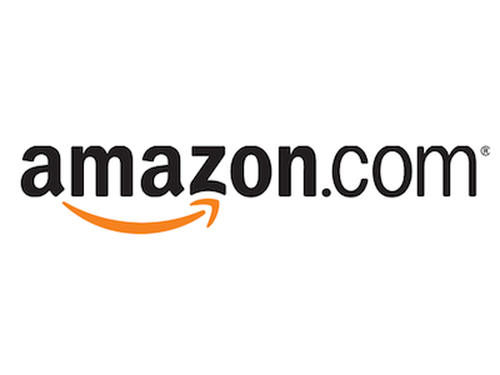 We offer a group purchase discount rate for multiple copies of the same study, to make it even more convenient. If you are interested, contact me from the sidebar. 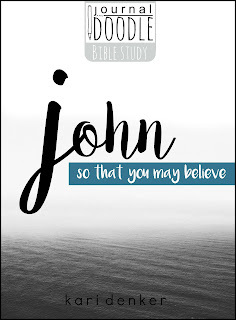 The Journal and Doodle through John study would be a great one to start with. It is full of even more doodles than previous studies and has lots of examples, journal prompts, and life application. 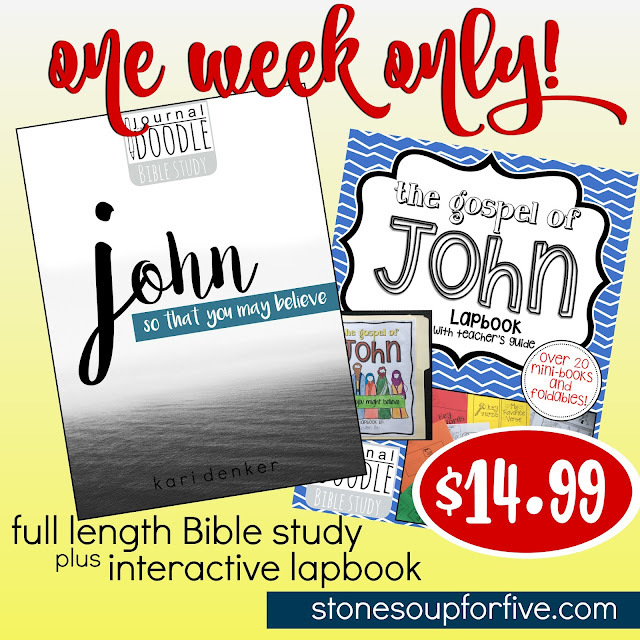 Plus, it's on special (along with an amazing lapbook) through Saturday, March 5! Use STONESOUP20 to get 20% off! Thanks for this encouraging post. I just asked a friend today to pray with me about starting a ladies fellowship group. This would be ideal! Question: What is a lapbook? Thanks! A lapbook is an activity book, designed for kids (but I love doing them) to get involved with you. It has all kinds of things you cut out and fold and paste and fill in that make it a really fun and interactive way to learn!